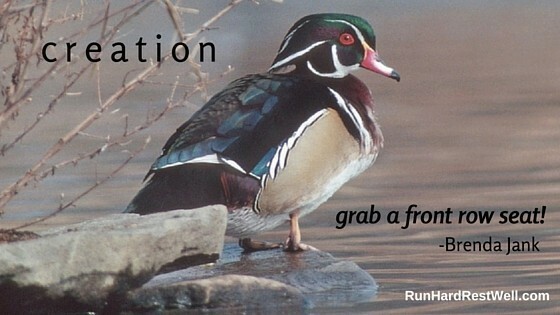 Of Wood Ducks and God • Run Hard. Rest Well. Our kids have grown up surrounded – surrounded by God’s glory. Most have a natural affection. One, who detests small things that crawl and fly, has been more reluctant to enjoy, unless riding on a tractor. Another lives outside, but with a ball in his hands and running shoes on his feet. Being captured by the quiet of creation is not his forte. God makes us all unique. On the way to the bus stop this morning, we could hear a duck amidst the noise of our flamboyant geese. My athletic son lit up. “A duck! Hear that, mom? I love Wood Ducks. Do you know they can climb trees?” Animated in every way, Noah went on to share a story of rescuing a baby Wood Duck a few summers ago. When our kids encounter God’s world, it leaves an imprint. As winter gives way to spring, take note of a few simple things like listening to the birds and watching for new buds. Do you know a kid? Love a kid? Grab ‘em and go. Go outside and get your feet a little muddy. Find a park, nature preserve, wetland and go – even if you have to put some miles on your car. Creation. Grab a front row seat. You will never be the same. Have you ever seen a baby Wood Duck climb? Some tree trunk nests can be 15-feet deep. Here’s a 37-second video clip. I think all people….small or large….enjoy the great outdoors, but often it takes work. We have to put aside our technology, and go. We have to get excited ourselves. We have to open the door for our kids to walk through. I wish it was easy. It’s not…..especially with our lives caught up in videos and TV and a dozen other traps. It’s like that with Jesus. He doesn’t jump in front of us to distract us from what we are doing. He doesn’t demand our time. He certainly doesn’t find Himself tweaking His presentation so it will become user friendly and up with the times. If we want it….it will require work…..ah, but the value, the gain, the joy and peace. Oh Betty — Powerful insights. Thank you!! Let’s wake up and take note. Getting outside takes work – but the dividends are worth their weight in gold.